Living a Fit and Full Life: Cleanse and Detox Your Hair and Scalp with Renpure's Amazing Plant Based Hair Care! Cleanse and Detox Your Hair and Scalp with Renpure's Amazing Plant Based Hair Care! We’re a family owned and operated business guided by two principles: Create the best products we can possibly make, and treat every single customer like family. This is what drives our brand forward, and our family to continue innovating and creating the best possible hair care solutions for you. We will never skimp on our ingredients, and we will always listen to our customers. All we want is to provide you with the best in hair care, and hope that you end up loving our products just as much as our family does! 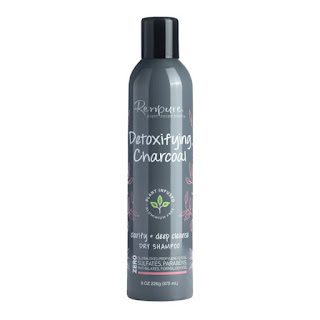 Deeply cleanses hair with the power of natural charcoal. 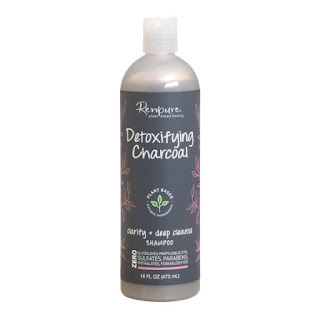 Charcoal removes impurities, leaving your hair feeling fresh and clean. Deeply condition hair with natural waxes and oils designed to seal in moisture and protect the hair and scalp. Keep your thick hair looking and feeling clean, oil-free, and refreshed. An evolution of cleaner ingredients and Rice Starch infused performance, and the versatility of bamboo derived charcoal to help cleanse, clarify, and detoxify the scalp and hair. Treat your hair to a gentle and soothing scrub that cleanses and exfoliates your scalp. Tea Tree cools the scalp while Himalayan sea salt removes buildup and flaking leaving your hair feeling clean and refreshed. Cleanse and detox your hair and scalp with Renpure's amazing plant based hair care! Renpure is a brand that I've recently discovered and have fallen in love with. I had the pleasure of trying the products above and I'm incredibly impressed and happy to have found plant based hair care products that actually work! 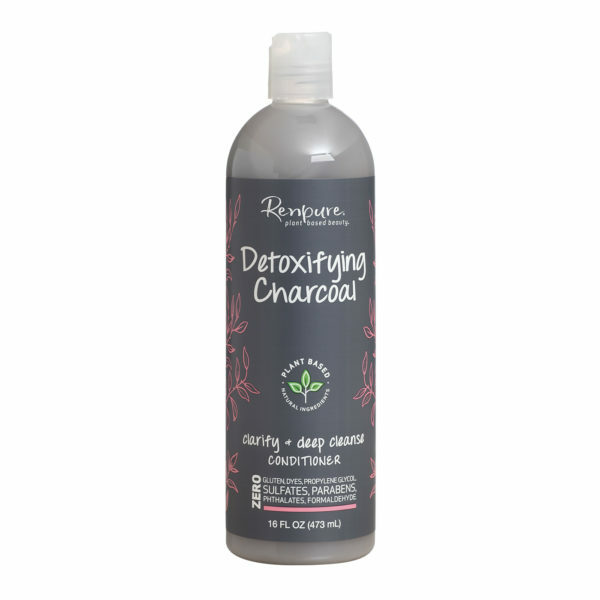 Renpure's Plant Based Detoxifying Charcoal Shampoo is an amazing shampoo! It lathers like a dream and leaves my hair squeaky clean thanks to its natural charcoal that helps to detox my hair. My hair is left feeling smoother than ever and incredibly light and clean. I absolutely love how well this shampoo works and that it doesn't contain sulfates, parabens, dyes, gluten, phthalates or propylene glycol. It's an absolutely amazing shampoo that you will love. 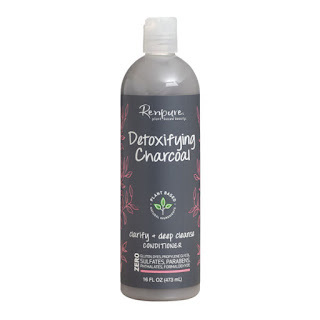 Plant Based Detoxifying Charcoal Conditioner from Renpure is the perfect conditioner! It works wonders to deeply condition hair with natural waxes and oils designed to seal in moisture and protect the hair and scalp. It leaves my hair incredibly conditioned and my hair looks more vibrant than ever. I also love that it doesn't contain any sulfates, parabens, dyes, gluten, phthalates or propylene glycol. It's the perfect conditioner for all hair types! 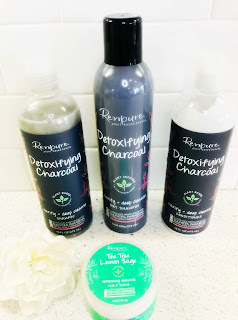 Renpure's Plant Based Detoxifying Charcoal Dry Shampoo is my new BFF! I absolutely love this dry shampoo because it keeps my hair looking and feeling clean, oil-free, and refreshed in between washes. It too contains no sulfates, parabens, dyes, gluten, phthalates or propylene glycol so there's no guilt when I'm spraying this amazing dry shampoo into my hair. It's amazing bamboo derived charcoal even helps to cleanse, clarify, and detoxify my scalp and hair. It's a terrific dry shampoo and a must have in my hair care routine! Tea Tree Lemon Sage Refreshing Moisture Scalp Scrub from Renpure is phenomenal! I've actually never used a scalp scrub before so I wasn't sure what to expect but boy was I impressed. My scalp has always been dry, itchy and even flaky but this product is the cure all. It felt incredibly soothing to use and left my hair and scalp feeling restored. It's the perfect way to keep your scalp healthy and happy! Renpure's amazing plant based hair care products are the perfect way to cleanse and detox your hair and scalp! Click HERE to find a store near you that sells Renpure! Click HERE to learn more about Renpure! Follow Renpure on social media!